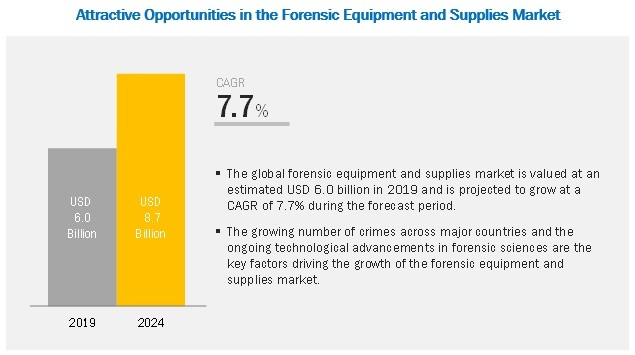 [219 Pages Report] The forensic equipment and supplies market is projected to grow to USD 8.7 billion by 2024 from USD 6.0 billion in 2019, at a CAGR of 7.7% during the forecast period. Growth in the forensic equipment and supplies market is primarily driven by factors such as the growing number of crimes across major countries, ongoing technological advancements in forensic sciences, growing public-private investments in the field of forensics, and the rising awareness among investigators about the role of DNA profiling in criminology. Forensic reagents include toxicology controls, supermixes, antibodies, enzymes, primers, probes, and specific-detection agents as well as consumables such as reaction tubes, needles, pipettes, clippers, vials, fingerprint powders, brushes, labels, and crime scene kits. These reagents are used in forensic applications for trace evidence detection. The growth of the reagents and consumables segment is attributed to factors such as the increasing number of criminal investigations, growing focus of governments on clearing the backlogs of crime cases, public-private investments in forensic sciences, and the rising awareness of DNA profiling in criminology across emerging and less-developed countries. Toxicology/toxicity testing includes the identification and quantification of pharmacological and chemical substances (such as heroin, cocaine, poisons, alcohols, metals, and gases) in a forensic sample. The growth of the drug testing/toxicology segment is attributed to factors such as the growing availability of innovative toxicity analysis platforms worldwide and the increasing number of drug testing laboratories across major countries. Government forensic laboratories utilize forensic equipment and supplies to perform key forensic analysis, such as DNA fingerprinting, facial identification, and histocompatibility analysis. Factors driving the growth of this segment include the growing funding and investments by governments to strengthen their analytical capabilities in the field of forensics and expand their coverage across sub-urban and rural areas to maintain law and order effectively. North America is one of the major revenue-generating regions in the forensic equipment and supplies market. The increasing public-private investments in the forensics industry in the US and Canada, ongoing technological advancements in forensic equipment, increasing commercialization of forensic equipment, and the presence of major market players in the region are the major factors driving the growth of the forensic equipment and supplies market in North America. Thermo Fisher Scientific (US), SCIEX (Danaher Corporation, US), PerkinElmer (US), Agilent Technologies (US), and Waters Corporation (US) were the top five players operating in the global forensic equipment and supplies market. Other prominent players operating in this market include GE Healthcare (US), QIAGEN NV (Netherlands), Spectris (UK), Air Science (US), Lynn Peavey Company (US), Sirchie (US), BVDA International (Netherlands), Safariland, LLC (US), Horiba (Japan), and Illumina, Inc. (US). Thermo Fisher Scientific (US) is one of the leading players operating in the forensic equipment and supplies market. The company has a strong presence in North America, Europe, the Asia Pacific, Africa, and the Middle East. The company operates its global operations through ~800 subsidiaries and focuses on strengthening its revenue growth and brand positioning by adopting growth strategies such as product commercialization and strategic acquisitions. For instance, Thermo Fisher Scientific acquired Advanced Scientifics, Inc. (US) and Finesse Solutions (US) in the last four years to expand and strengthen its automation systems and software product portfolio for bioproduction and forensic technologies. In June 2016, Thermo Fisher launched the Thermo Scientific Q Exactive BioPharma MS/MS Hybrid Quadrupole-Orbitrap mass spectrometer. This helped the company to improve its position in the forensic equipment and supplies market. What are the growth opportunities related to the adoption of mass spectrometers across major regions in the coming years? Emerging countries will offer immense opportunities for the growth and adoption of forensic equipment and supplies. Will this scenario continue in the coming years? Where will all the advancements in products offered by various companies take the industry in the mid-to-long term? What are the various laboratories where forensic equipment find a high adoption rate? What are the new trends and advancements in the forensic equipment and supplies market? The study involved four major activities to estimate the current size of the forensic equipment and supplies market. Exhaustive secondary research was carried out to collect information on the market and its different subsegments. The next step was to validate these findings, assumptions, and sizing with industry experts across the value chain through primary research. Top-down and bottom-up approaches were employed to estimate the complete market size. Thereafter, market breakdown and data triangulation procedures were used to estimate the size of segments and subsegments. In the secondary research process, various secondary sources, such as annual reports, press releases & investor presentations of companies, white papers, certified publications, articles by recognized authors, gold-standard & silver-standard websites, regulatory bodies, and databases (such as D&B Hoovers, Bloomberg Business, and Factiva) were referred to in order to identify and collect information for this study. After arriving at the overall market size—using the market size estimation processes as explained above—the market was split into several segments and subsegments. In order to complete the overall market engineering process and arrive at the exact statistics of each market segment and subsegment, data triangulation and market breakdown procedures were employed, wherever applicable. The data was triangulated by studying various factors and trends from both the demand and supply sides in the forensic equipment and supplies industry. Thermo Fisher Scientific (US), SCIEX (Danaher Corporation, US), PerkinElmer (US), Agilent Technologies (US), Waters Corporation (US), GE Healthcare (US), QIAGEN NV (Netherlands), Spectris (UK), Air Science (US), Lynn Peavey Company (US), Sirchie (US), BVDA International (Netherlands), Safariland, LLC (US), Horiba (Japan), and Illumina, Inc. (US). This research report categorizes the forensic equipment and supplies market based on product, application, end user, and region.